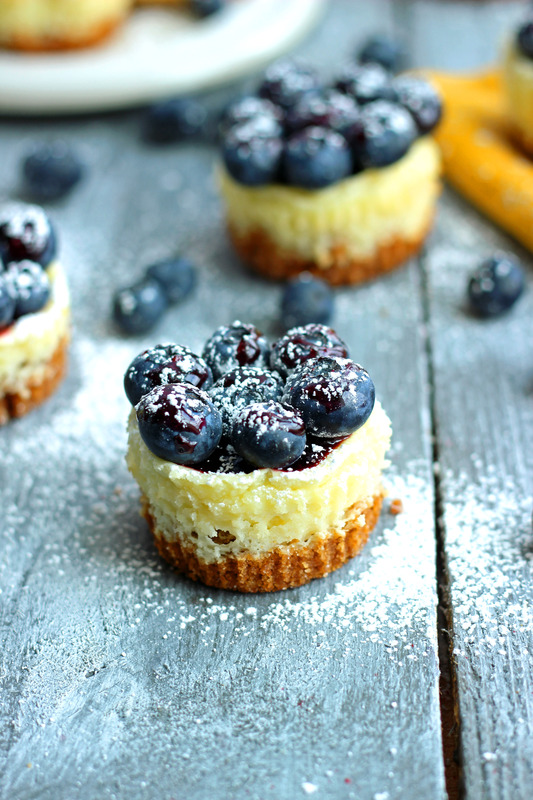 Miniature sized cheesecakes flavored with a hint of lemon, topped with blueberry jam, and covered with lots of fresh blueberries. The crust is a simple graham cracker crust pressed into the bottom of a lined muffin tin. A quick tip – you can use the lid of your milk to press down the crumbs and create the perfect mini cheesecake crust. These look incredible, Chelsea! 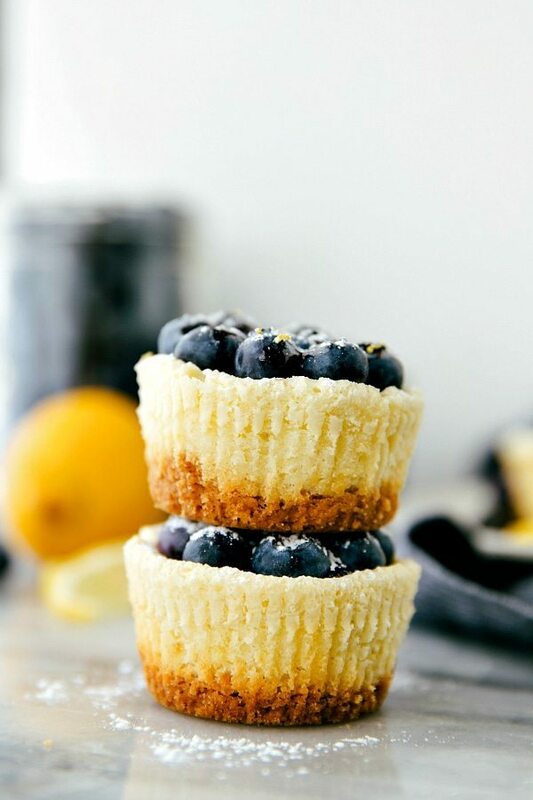 I love the idea of mini cheesecakes. Cheesecake can be heavy, but having a little bite sized amount sounds just perfect! Photo styled to perfection – these look delish! So pretty Chelsea!!! I love love LOVE cheesecake, and these look just divine! Thank you Nicole! Have a great weekend! These look so cute and delicious!! 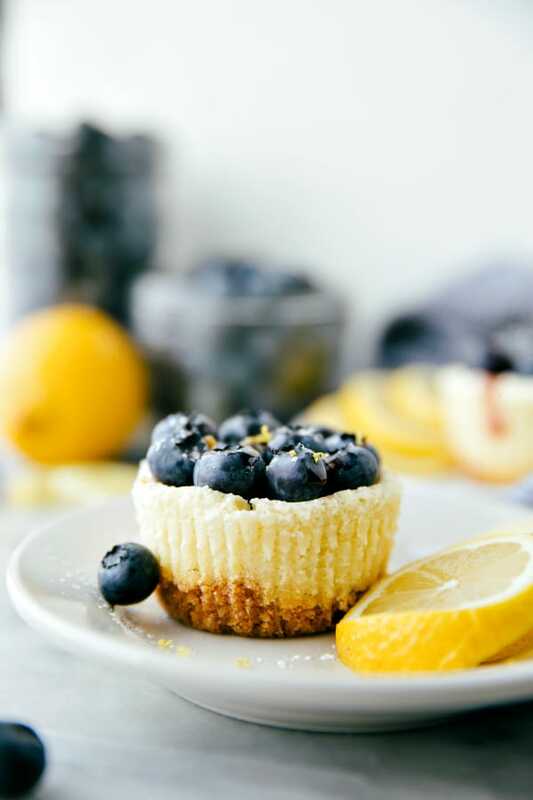 Love the blueberry lemon combo, and the fact that they’re so easy to make for a cheesecake. Pinned! I’m all about an easier cheesecake version! Thanks Rachel, and have a great weekend! Chelsea I love this! Great recipe, great photos. I didn’t start “setting my scene” like this for months, you’re way ahead of the game girl, keep it up!! These photos are stunning! And I love the lemon/blueberry combo, sounds delicious! these are beautylicious!! Seriously can’t stop looking at them! And now I’ll be dreaming about them all day at work. These cheesecakes are so cute! I’ve always been intimidated by cheesecake, but I made one back before Christmas and it was totally fine! I’ve been wanting to make some mini ones since then, and these are just too precious! Oh this combo just makes me think of spring for some reason! 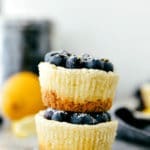 I (weirdly) used to hate lemon in desserts but have come around : ) And I really have gotten into the lemon / blueberry combo and these little babies sound awesome! Plus they are cheesecake after all! Thanks so much Erin! 🙂 You have a great weekend! I love the gorgeous color blueberries give everything. These look incredible! I loveee love love cheesecake! I also love portions 😉 makes things so much easier. And this is a great recipe – the combination of lemon and blueberries is just magical. Haha I totally agree – they are definitely a magical combination! And portions for cheesecake is a must! I was TOTALLY ogling these on FoodGawker earlier this week. They are beautiful!!! Funny I found them again at Saturday Night Fever! This cheesecake and me were meant to be. These mini cheesecakes look over the top delicious, and they’re pretty as well. What a great idea, especially for a party or group get together! Thanks for sharing! Popping over from Saturday Night Fever –those cheesecakes are totally gorgeous! I have one jar of blueberry jam leftover from this summer that I have been hoarding. These might be the perfect reason to finally open it. I love these cheesecakes! they are sooo cute! These cheesecakes were SOOOOOO easy to make. I made them for a friend’s BD party and they received an “excellent” from all those at the party! If I were to make these mini what would the cook time be? Really enjoyed these! Had them tonight for our Valentine’s treat. The only thing I would adjust is the crust to half of what is recommended . Otherwise loved the flavors! So glad to hear you enjoyed these! 🙂 And definitely feel free to halve that crust the next time 🙂 Thanks for the comment! Hi. I searched for a mini Cheesecake receipe and happened to stumble upon yours. I thank my stars for this. Tried it yesterday and these are the most delicious cheesecakes I have ever had. The tang from the lemons and zest blends beautifully with the fresh blueberries. Thank you for a wonderful receipe. What size package of cream cheese is required? I’ll be making these in a couple of days and was wondering, if I make them in advance do you recommend waiting to put the jam on? Or would it be OK to put the jam on and put them in the fridge to store for a day? How much is 4 sheets of graham crackers?